Formed in 1931 due to the construction of the Bagnell Dam, Camdenton, Missouri became “The Hub City of the Ozarks”. This splendid city of 4,000 inhabitants is located in Central Missouri on the western edge of Lake of the Ozarks, along the Niangua arm. Marked by such natural wonders as bluffs, caves and springs, there is always something beautiful to discover in Camdenton. In Ha Ha Tonka State Park, visitors will enjoy 15 miles of hiking trails, boating, fishing, and swimming on 3,710 acres. The Camdenton City Park spans 120 acres and features athletic fields, a playground, skate park, pavilions and aquatic center. Other entertainment in town includes bowling, laser tag, arcades, mini golf and movies. There are half a dozen golf clubs in the lake area, as well as a number of wineries. Conveniences such as groceries, pharmacies and banks are all centrally located. Camdenton is populated with a wide variety of diverse properties. Quaint single family homes in Camdenton are reasonably priced, many of them older builds. Common architectural styles are Ranch, A-Frame, Split Level and Cabin. 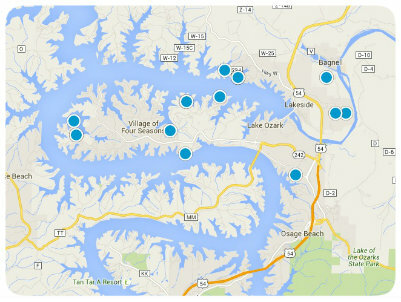 Homebuyers in search of luxury waterfront homes will also find a number of fantastic options in Camdenton. Mostly newer constructions, these estate homes feature amenities such as gourmet kitchens, wine cellars, swimming pools and private slips on several acres of land. Whether a multi million dollar estate or a two bedroom cabin, what most homes in Camdenton share is outdoor space. Patios, decks or wooded backyards, nature surrounds and the residents of Camdenton revel in it. If you would like more information regarding homes for sale in Camdenton, Missouri, please do not hesitate to contact us today..